The week started off with Cameron's nanny, Anne, able to work again after her back injury- welcome back Annie! Cam was so happy to see her. 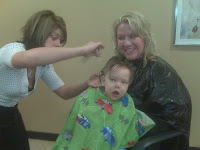 Tuesday was another 1st for Cameron- after work, Chris & Jane took Cam to get his very first haircut at Design One! He sat on Jane's lap, while Mandy expertly trimmed his fine hair. (In fact, she's so fast you can't even see her scissors in this picture!) He was such a good boy and gave the salon girls some big smiles when he was all done. 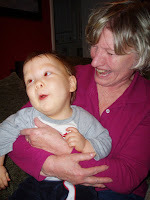 On Friday, Cameron went over to Fresh Market with Grandma & Jane. They had holiday food samples. Cam decided that the turkey and stuffing were pretty good, but then he tasted what may be his favorite dessert of all- Sweet Potato Pie! He kept s aying, "hmm, ummm, nummm." Imagine his surprise to taste his favorite veggie in an after-dinner delight! 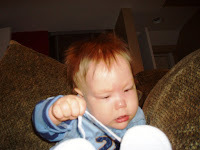 Cameron's latest hobby is to untie his shoes. Doesn't he look intent on completing the task? 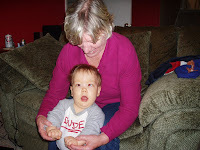 His favorite sound this week seems to be "ohhhh" which he is demonstrating here with Grandma. Cam noticed the first snowflakes of the season falling on Sunday morning. It's hard to believe that more of those are just around the corner- Stay Warm everyone! !